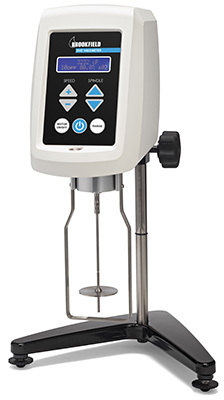 The New DVE Viscometer, featuring a brand new user interface and keypad. The updated DVE now has a contemporary design, adopting the look & feel of the DV1, DV2T and DV3T family. The attractively lit display features distinctive alpha-numeric characters that are easy to view, both close up and at distance. The bubble level has been conveniently situated on the front of the instrument below the display panel so that users can easily adjust the instrument for true vertical position. The updated DVE also offers a choice of scientific units for viscosity measurement including both cgs units: cP (centipoises) and P (Poise), and SI units: Pa-s (Pascal-seconds) and mPa-s (milliPascal-seconds). All (RV/HA/HB) instruments now include spindles #2-7. The #1 spindle is now optional for the low range. The guardleg on all HA/HB models is no longer included.